The large HAB event that began in Southern California has also manifested in the Monterey Bay region. This is a natural phenomenon, and will likely subside with a change in the upwelling/downwelling conditions. As part of Cal-PReEMPT we picked up an increase in Pseudo-nitzschia at our study site in San Luis Obispo towards the end of March. We increased our sampling frequency at this site and observed domoic acid toxin levels in mussels go from nondetect on April 6 to 16 ppm by April 9. The bloom persisted at this site, although toxin levels did not exceed the alert level of 20 ppm until April 25. During this time we also had significant, but lower, cell numbers at our Santa Cruz and Marin field sites, with no detectable DA. In early April a volunteer in Santa Barbara reported bloom levels of Pseudo-nitzschia just north of Goleta, CA. Santa Barbara Mariculture Company (SBMC) went from non-detect on April 3 to a positive result the next week. 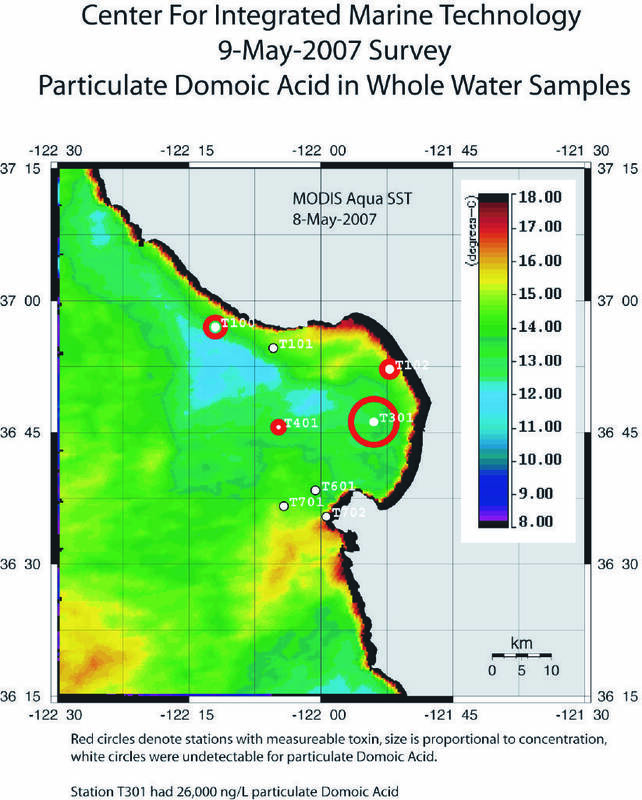 When samples from this site arrived at the CDPH lab the positive result was confirmed, with the lab reporting a DA concentration of 62 ppm in the mussels.The event has been moving down coast over time, with very high levels of domoic acid subsequently being detected in Ventura County (April 19). Dave Caron and Astrid Schnetzer working on their NOAA-funded RAPD-ALERT project reported a massive Pseudo-nitzschia bloom throughout their study grid last week off of LA Harbor. Peter Miller is a collaborator on this project and confirmed the identity of the bloom species as P. australis. The CDPH Food and Drug Branch have detected DA above the alert level in samples of sardines/anchovies from this location, and this probably ties-in with the wildlife impacts reported around LA and Orange counties. 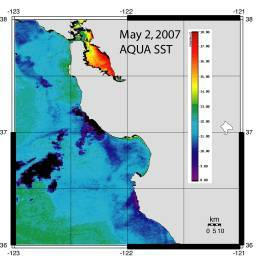 After identifying the HAB event at Avila Beach, we initiated additional sampling on 27 April, 2007 in the Monterey Bay region. Water samples for particulate domoic acid (DA) and mussels were collected from Davenport, Santa Cruz Wharf, and Natural Bridges. Toxin testing on those samples showed no measurable particulate DA in the water, and very low (< 1ppm) DA in mussels. 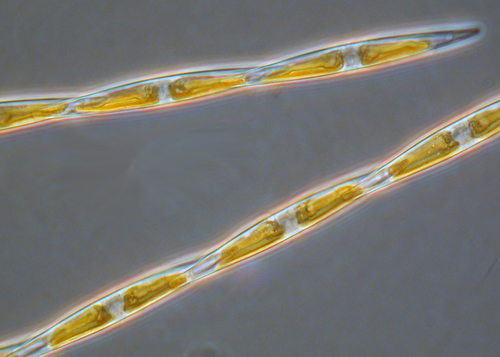 On 2 May, 2007, the weekly Santa Cruz Wharf sampling identified a large Pseudo-nitzschia australis bloom (Figure 1, 2). Preliminary results (not yet confirmed) indicate that there were high levels of domoic acid at SC Wharf on 2 May. 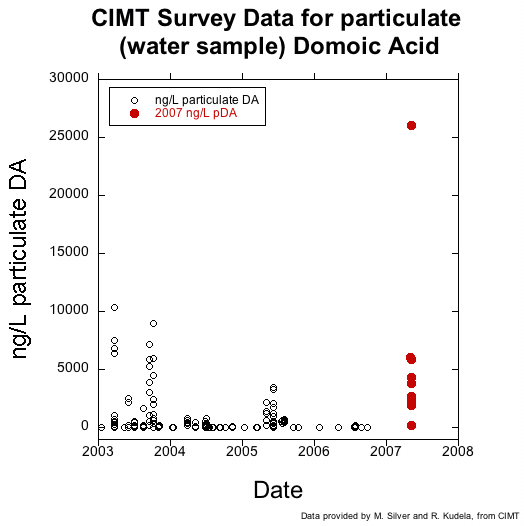 Samples from mid-April to 2 May from Santa Cruz Wharf were low/negative for DA. On 9 May, the Santa Cruz Wharf sampling showed a large decrease in Pseudo-nitzschia abundance coinciding with a very large red tide event, caused by the non-toxic dinoflagellate Ceratium divaricatum (Figure 3). 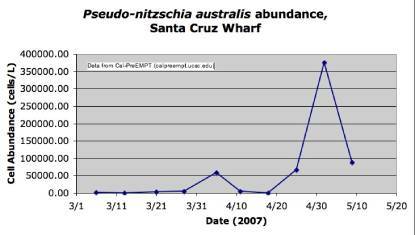 On 2 May, 2007, the weekly Santa Cruz Wharf sampling identified a large Pseudo-nitzschia australis bloom. Preliminary results (not yet confirmed) indicate that there were high levels of domoic acid at SC Wharf on 2 May. 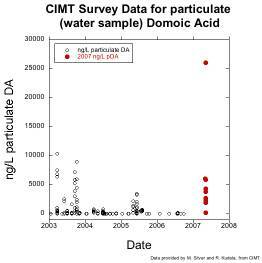 Samples from mid-April to 2 May from Santa Cruz Wharf were low/negative for DA. On 9 May, the Santa Cruz Wharf sampling showed a large decrease in Pseudo-nitzschia abundance coinciding with a very large red tide event, caused by the non-toxic dinoflagellate Ceratium divaricatum. The Center for Integrated Marine Technology conducted a Bay-wide survey on 8-9 May. Samples for HAB species and domoic acid are currently being analyzed. Observers reported larger phytoplankton blooms in the north part of the Bay, with relatively clear water in the south. 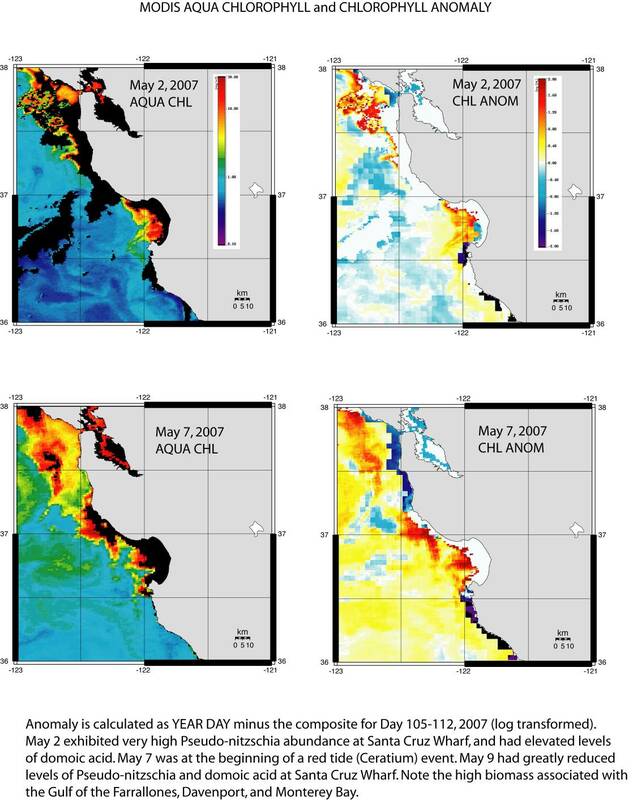 Click images for larger,full panel versions of the chlorophyll and SST anomalies. Remote sensing imagery show the change in chlorophyll and SST relative to the time immediately preceding the HAB events in central California. There was a dramatic warming in early May, associated with large phytoplankton blooms in coastal waters. The increase in Pseudo-nitzschia was generally associated with upwelling-favorable conditions, while the transition to dinoflagellates appears to be associated with the rapid warming. To examine the bloom events more closely, MODIS 250 meter resolution data was acquired for 27 April, 2, 5, and 8 May. 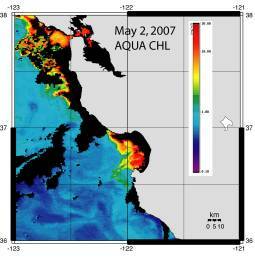 Images were processed for chlorophyll, sea surface temperature, and fluorescence line height (link). 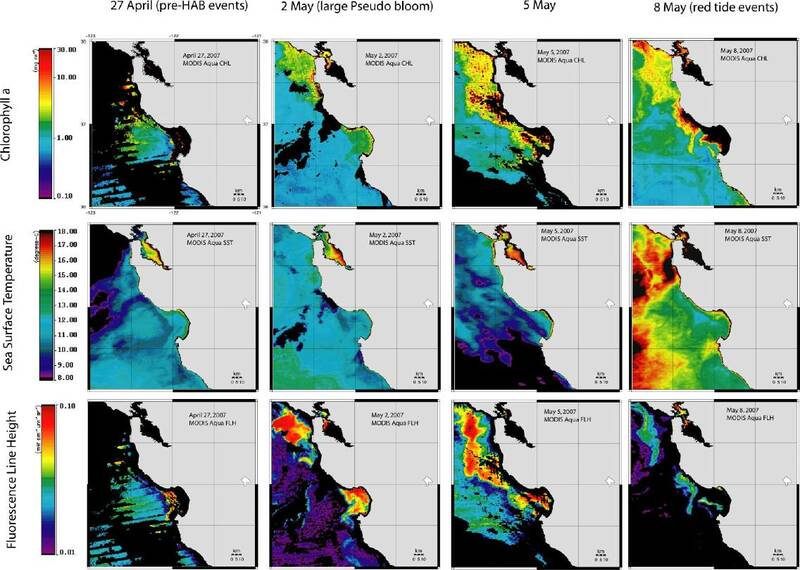 The sequential imagery again shows the warming event, and also suggests that the bloom occurred both within the northern part of Monterey Bay and more broadly between Monterey and San Francisco. 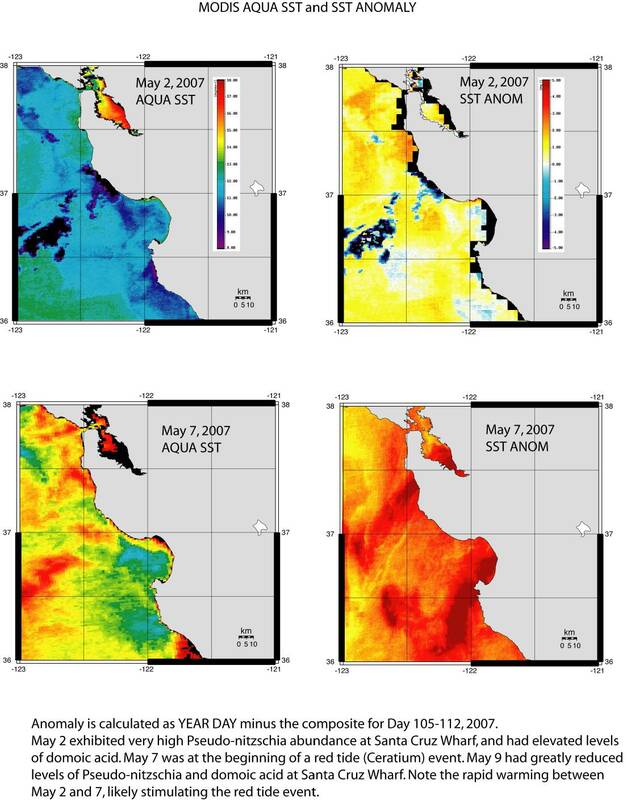 Multi-panel imagery of chlorophyll, SST, and fluorescence line height before and during the HAB event in Monterey. Click for a larger version. CIMT and Cal-PReEMPT were able to rapidly sample the Bay this past week, as part of the ongoing monitoring efforts (established in 2002). We have been able to turn the toxin samples around very quickly, and can now provide preliminary results. Note that these values are currently being confirmed by a second, independent method, so should be considered preliminary. The panel at left shows this recent event (red) relative to the CIMT sampling that has taken place since 2002. Peak toxin values at the SC Wharf on 2 May, of >6000 ng/L particulate domoic acid, with Pseudo-nitzschia abundances > 500,000 cells/L were observed. 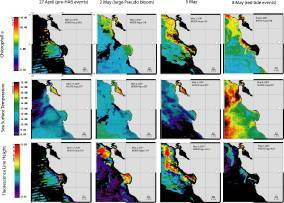 Similar values were also reported by G. Jason Smith at Moss Landing Marine Labs from their Monterey time series. On 9 May, abundance was reduced to ca. 85,000 cells/L, and toxin dropped to about 2200 ng/L (still very toxic). Spatial survey results from CIMT show high levels of toxin in the central and northern Monterey Bay. The toxin is highest at mid-bay (approximately >10,000 ng/L), with high values reported to the north, but no detectable toxin offshore in the south bay (note however that toxin is being detected at Monterey Wharf by Smith's group). There were several frontal features during the sampling event, and Mary Silver and John Ryan (Monterey Bay Aquarium Research Instititute) have reported very patchy distributions of algae throughout the bay. For context, we have not seen these levels of toxin since at least 2002, and these are some of the highest concentrations reported for California (> 10 ug/L, or > 10,000 ng/L). 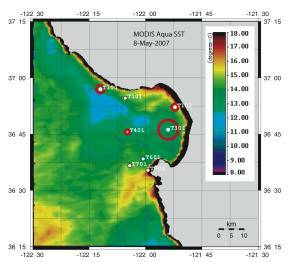 Map of stations and DA concentrations from the 9-May-2007 CIMT survey. Click for a larger version.